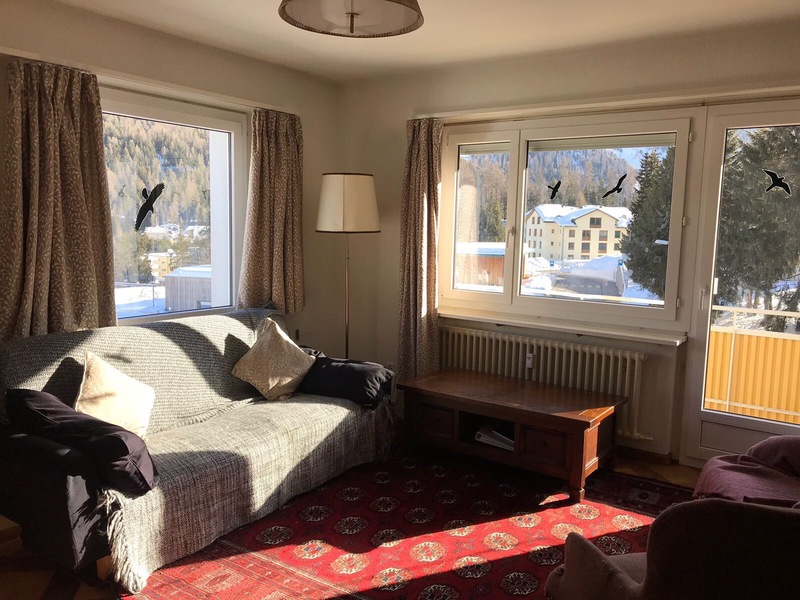 This bright apartment, sleeping six in three bedrooms, is in a prime position in St Moritz Bad, close to the ski run to the Signal Bahn gondola, and only a two-minute walk from bakery, restaurants, co-op and bus stop. 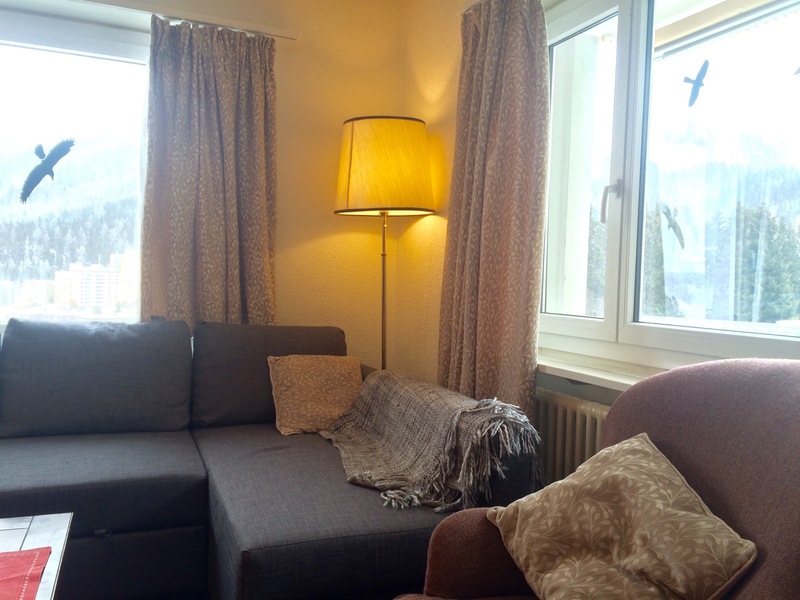 The flat has great views on three sides to St Moritz Dorf, the lake and surrounding mountains. In summer the excellent walking, watersports and mountaineering are all close at hand. 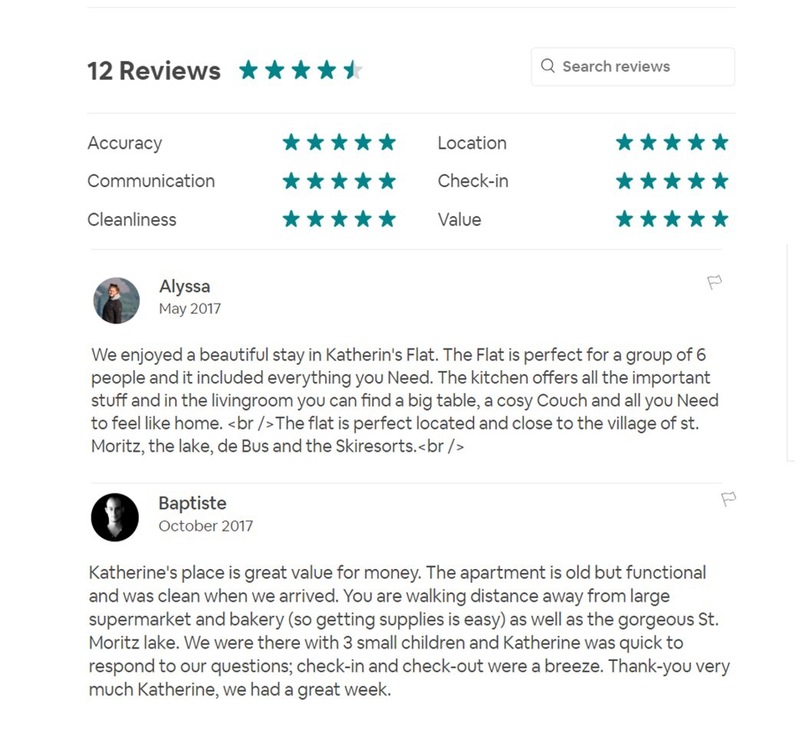 This apartment is perfect for a group or family seeking a functional, spacious apartment with views, in a brilliant location in which to top and tail your daily outdoor adventures. 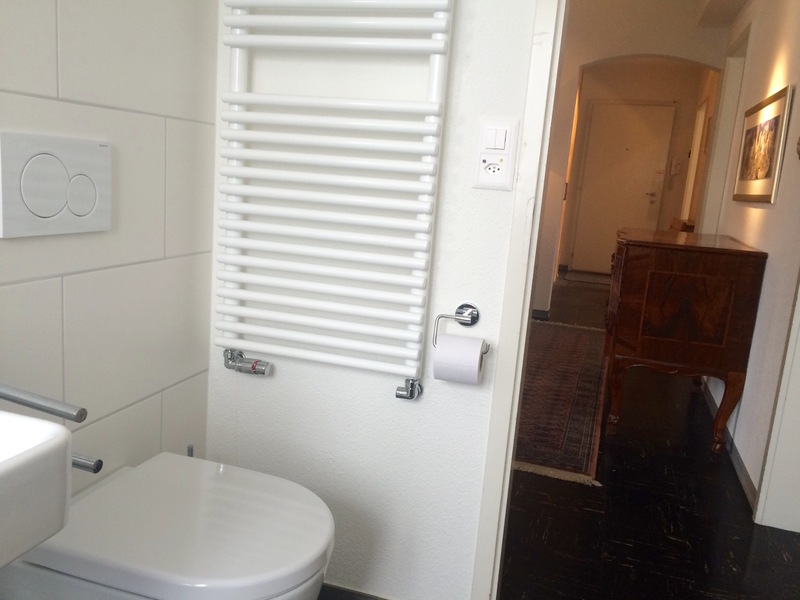 Tourist tax, linen and towels are all included in the cost. 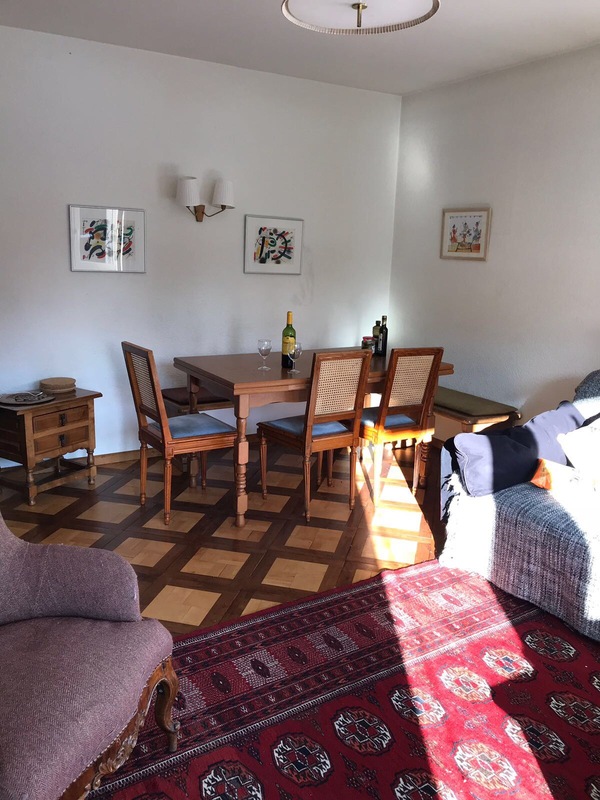 The flat has a comfortable Living and Dining room with balcony and large windows on two sides with views of mountains and the lake. 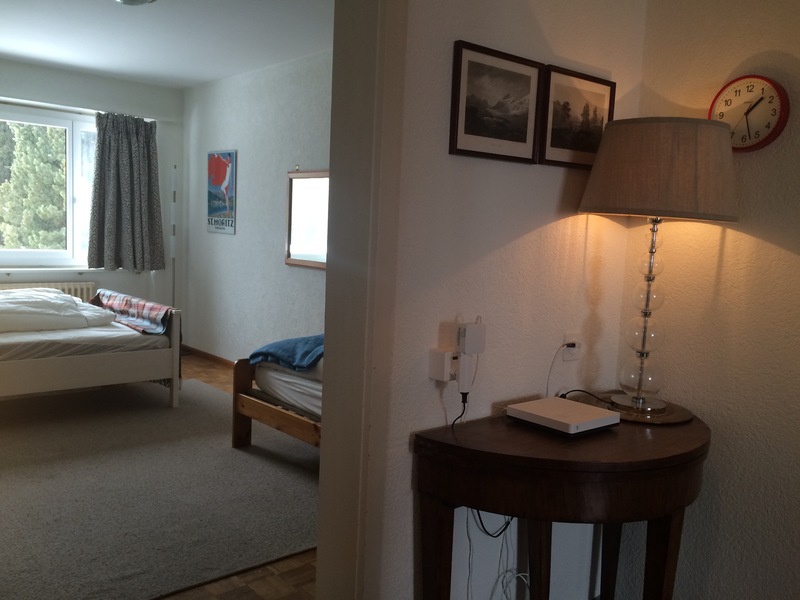 Our flat is not the typically slick, expensively done out, St Moritz flat. It has been in the family since it was built in 1961 and has been a much-used and much-loved family holiday home, since then. 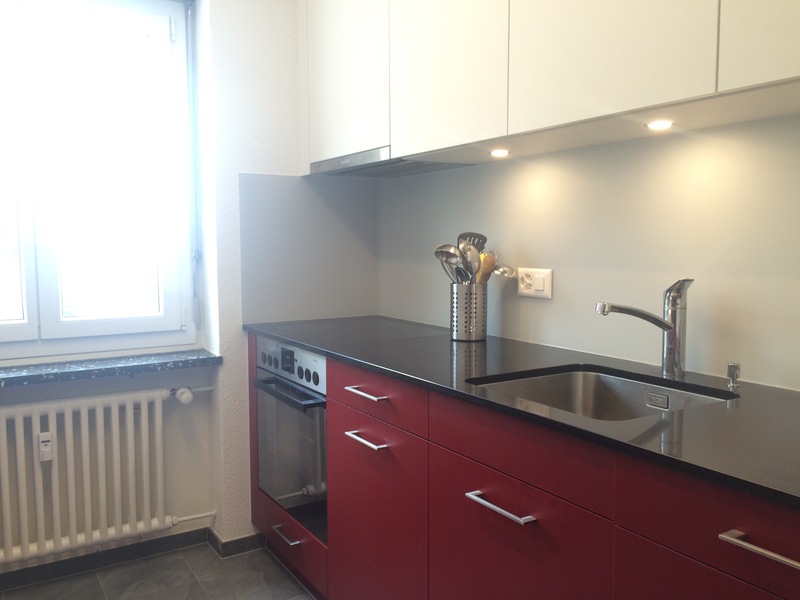 We have recently put in a new kitchen and two new bathrooms which bring the apartment more up to date. 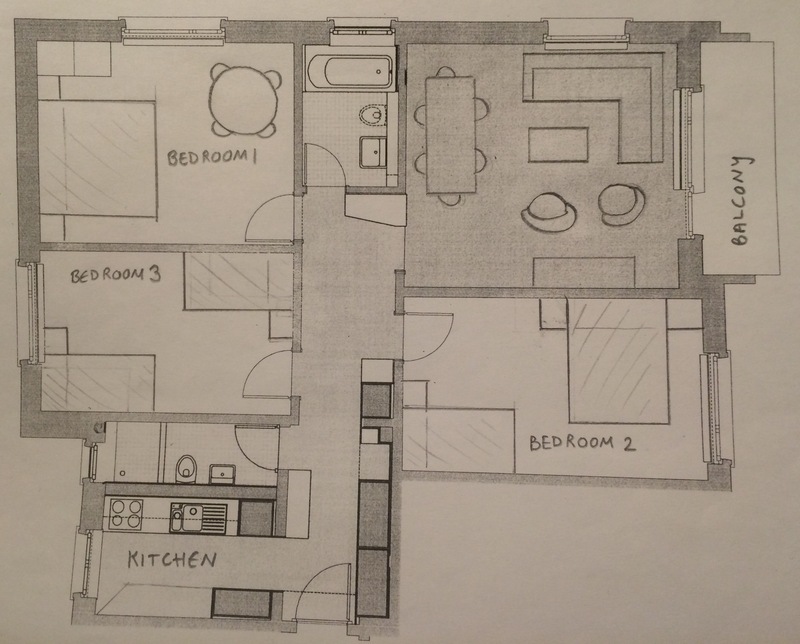 There are three bedrooms: a double, with king-size bed, and two twin rooms. 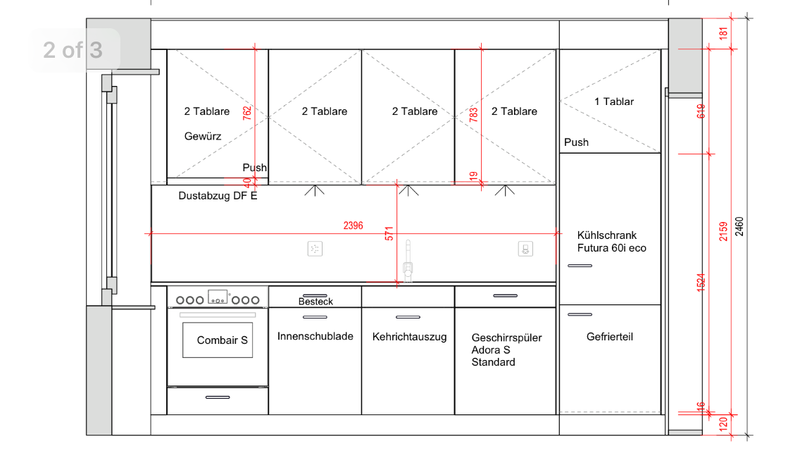 The open plan living-dining room has a balcony and windows on two sides. 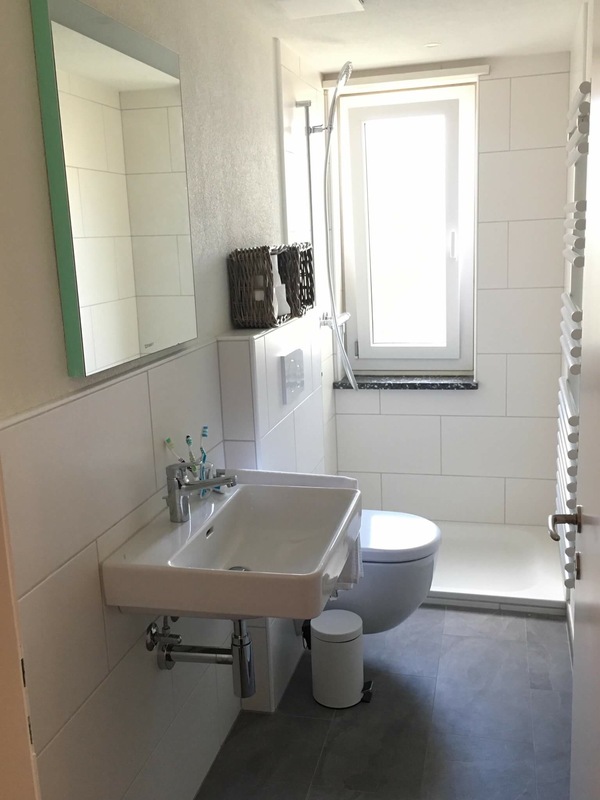 There is a seperate kitchen, a toilet and a bathroom. 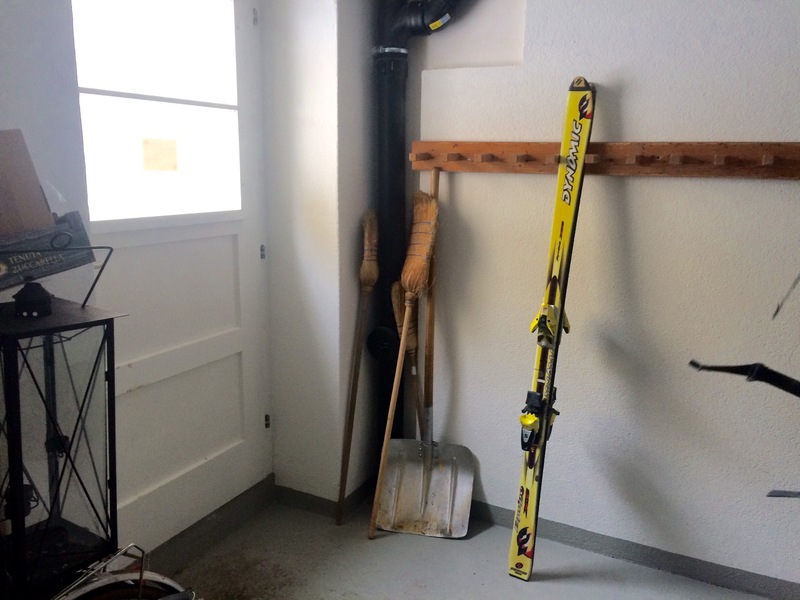 The flat has a lift and downstairs in the apartment block is a shared ski/boot-room. 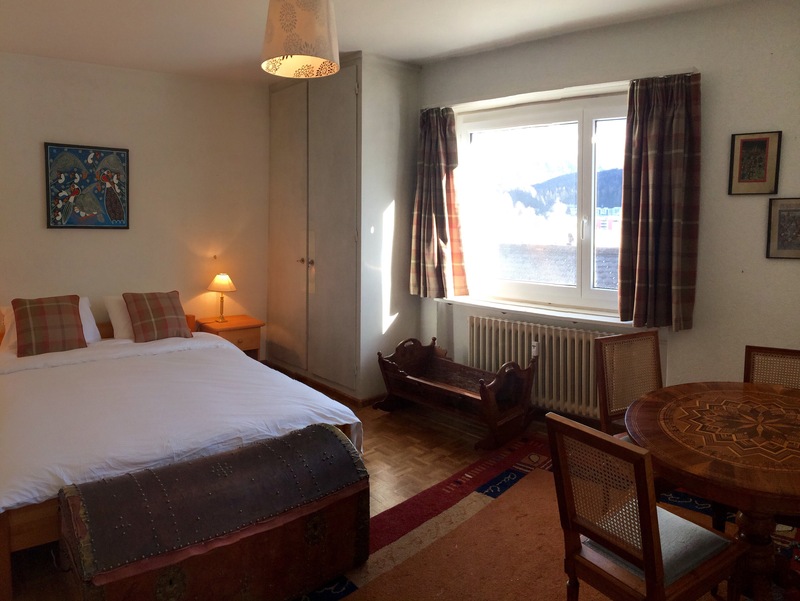 Sitting area in the main bedroom with a view of Corvatsch, the lake and St Moritz Bad. 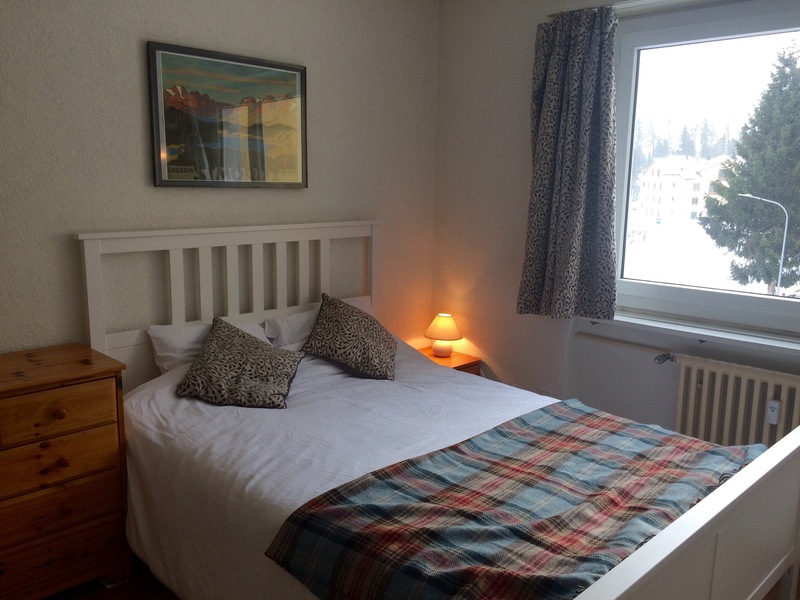 The apartment is a 2 minute walk from shops and the bus and 5minutes walk from the ski slope where you can access amazing skiing. 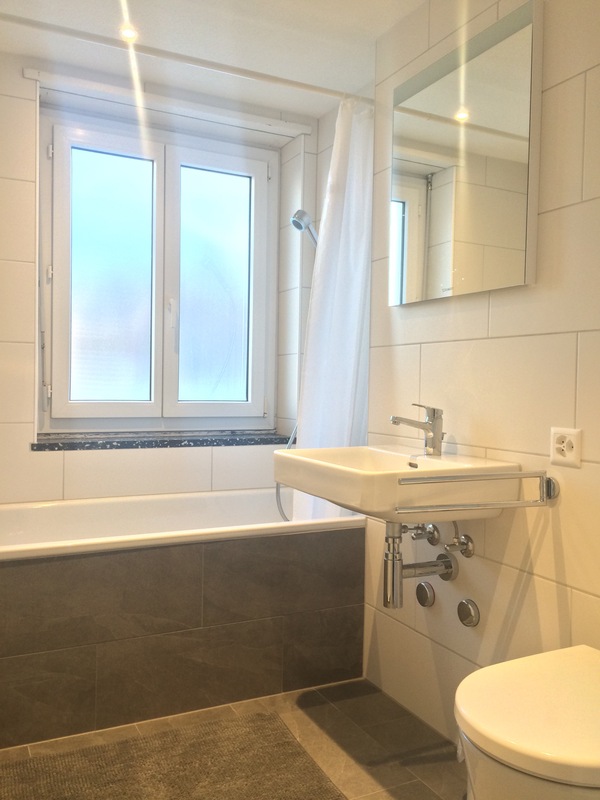 Two Bathrooms: one with bath and one with shower. Ski almost back to the flat, 5 min walk to ski slope in the morning. 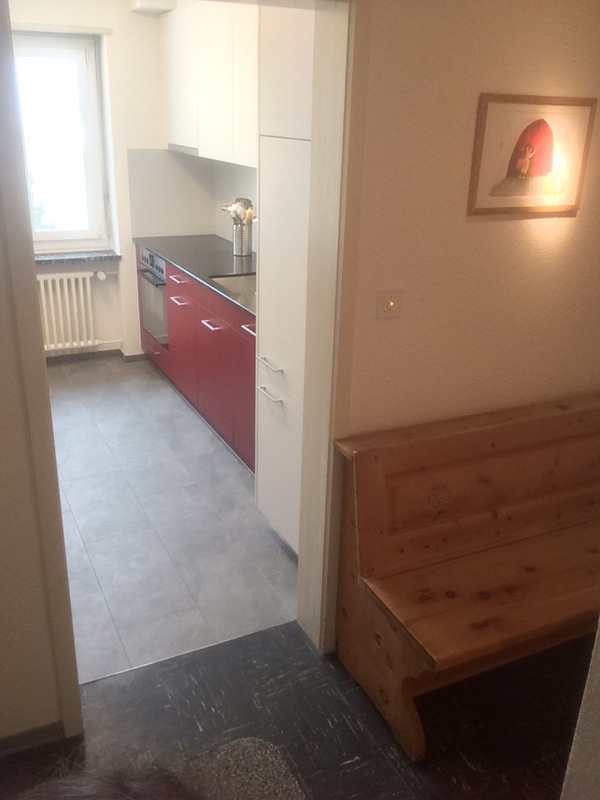 Large fridge freezer, raclette machine and fondue set available. 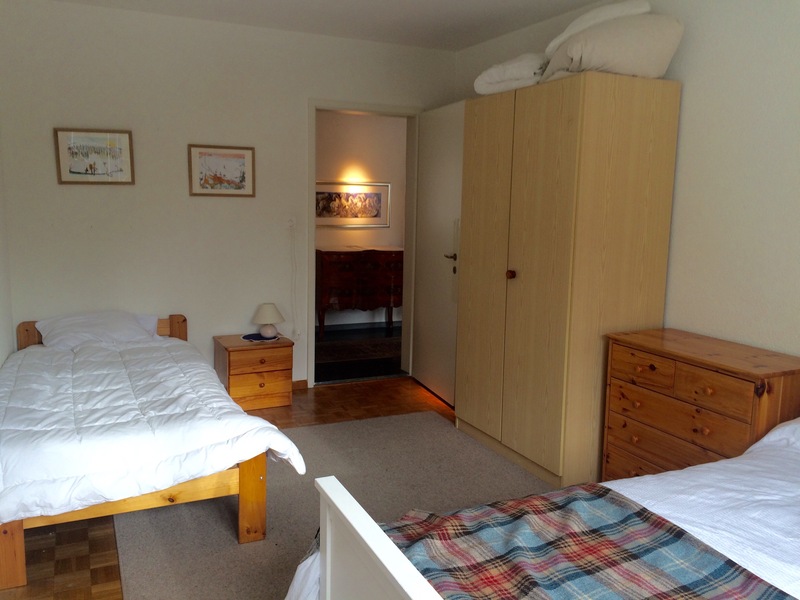 Shared washing machine, tumble dryer and drying room in the basement. View from the main bedroom and sitting room. Skiing back to the flat. The ski route down the mountain takes you a few 100 metres from the flat. Follow signs to St Mortiz Bad as you ski down from Signalbahn. Straight after the tunnel under the road on the final approach to Signalbahn, turn left and cut over the field towards the flats. You can either take a lower route and arrive at the top of via Salet and it’s a short walk down the road to the flat. Or take a higher line between the apartment blocks which will take you down right next to the apartment. 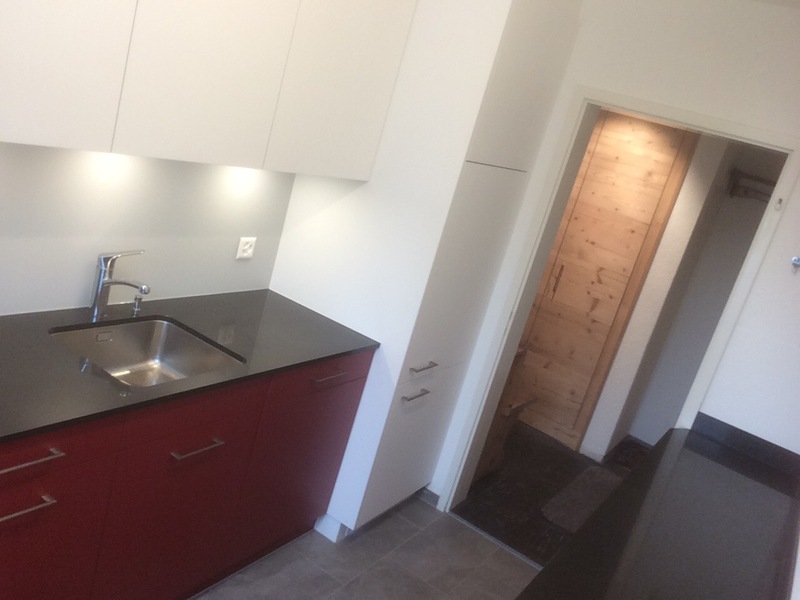 Via Salet 10 is in a very accessible position in St Moritz Bad. 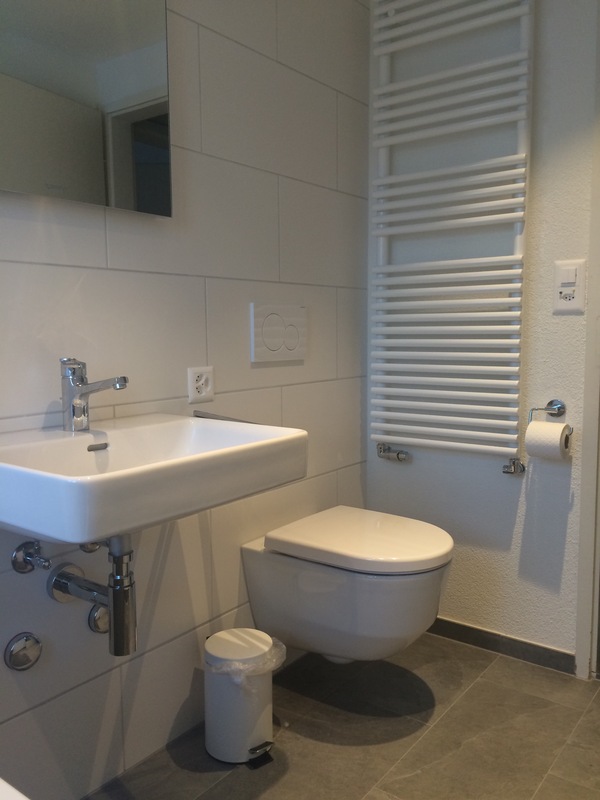 It is a 5 minute walk to the ski slope that will take you directly down to the Signal Bahn (ski almost all the way back to the flat), the gondola linking St Moritz Bad to the Coviligia ski area. 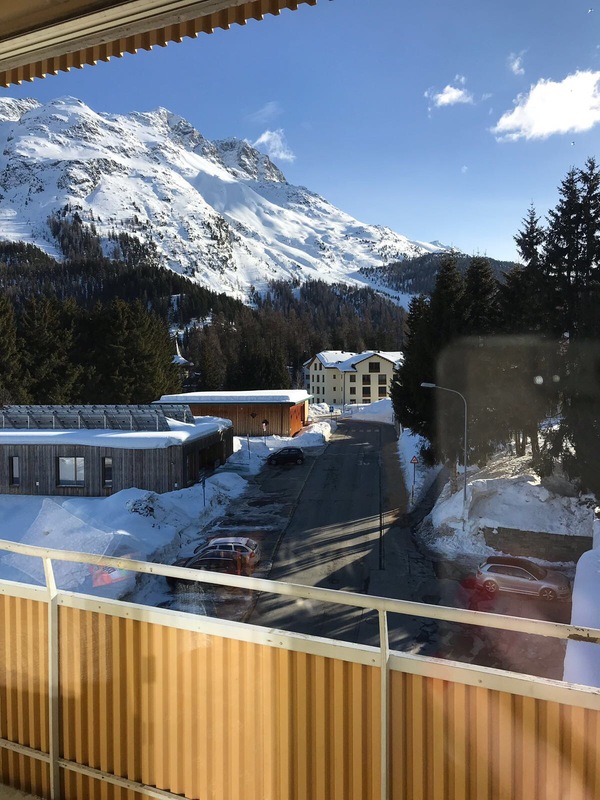 A 2 minute walk will take you to the coop, a bakery and a bus stop with direct buses to the train station, St Moritz centre, Corvatsch, Diavolezza and Lagalp. There’s a fondue and raclette set at the flat if you want to use it. 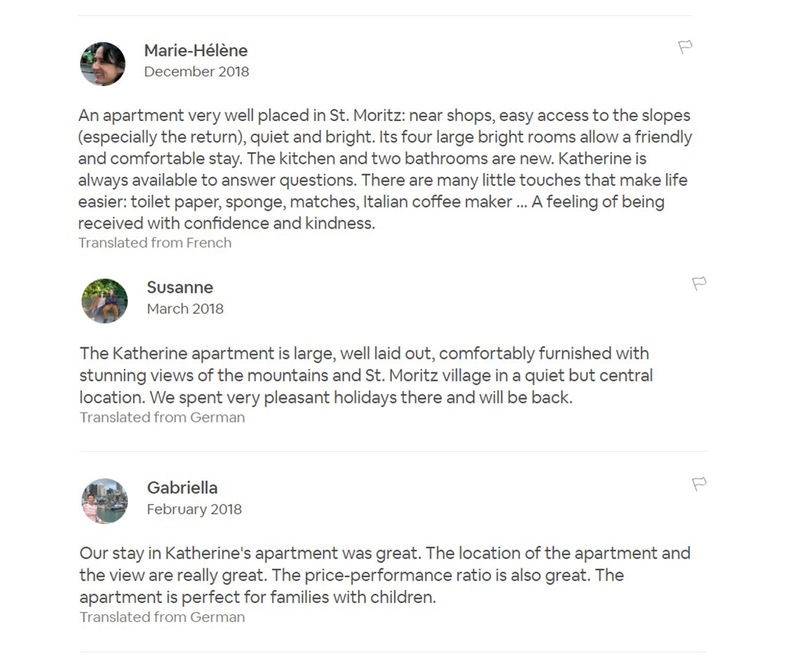 These are a reviews from AirBnB guests. For information about things to do in Autumn, Summer and Spring read this. 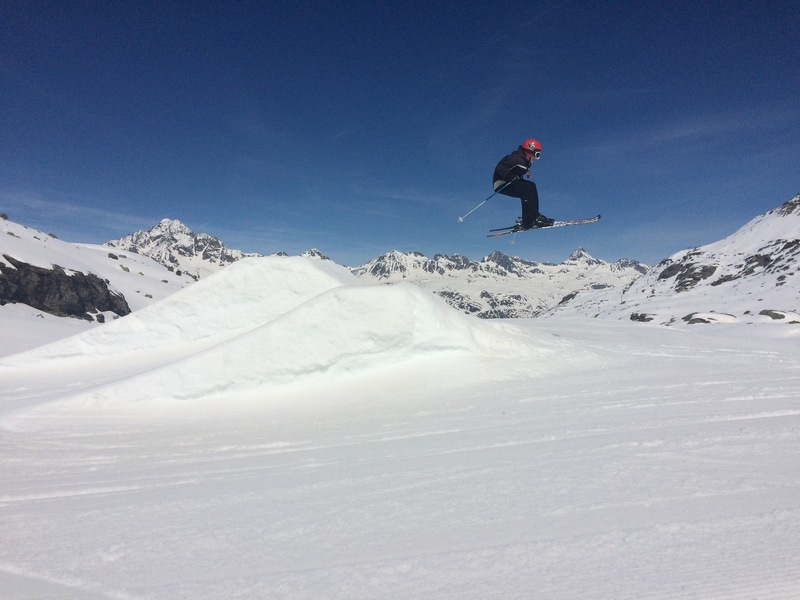 There are four ski areas accessible on the Ski pass; the Corvglia area behind St Moritz Bad and Dorf is a fantastic playground of easy slopes to harder and has a snow park for freestylers. You could easily ski all week here and desire nothing else. It is sunny, there is not a drag lift on the entire mountain, only fast-moving 4 to 6 seater chairs with bubbles to protect you from the elements. Go for the Paradiso area in the morning as there is practically no-one there and it has the best morning snow and gets shady later on (in midwinter). Then over to Marguns and Piz Nair at lunchtime. The lifts start at 8am and the slopes are deserted til 930am so getting up early is well worth it. The other side of the mountain is Corvatch, a steeper area with narrower and harder runs. Corvatsch boasts a world class freestyle snow-park and has floodlit skiing on Friday nights with DJs til 2am. While Corviglia closes soon after the Easter holidays, Corvatsch stays open until May. An amazing day-trip is to Diavolezza. It’s a beautiful train ride to a fantatsic skiing mountain. One big lift to the top and one looooong run all the way down. Once the crevasses fill, there is a yellow run (glacier marked off-piste) that will take you across the glacier, down a gulley on the rock nunatak in the middle and all the way to the bottom of the Glacier where you find a restaurant and train station to take you back to St Moritz. There is a coop a few minutes walk away that you can buy food and wine etc, it also sells gloves and other items of emergency ski equipment that would cost you an arm and a leg anywhere else in St Moritz. Amazing fresh bread croissants and all kinds of pastries for breakfast and the mountain essential Engadine Nüsstorte can be bought at the Konditori at the end of Via Salet and turn right. They open at 7am. On the slopes, a great afternoon Gluwein stop is the Raclette Stube at the top of Paradiso. Wonderful atomosphere, amazing views and always stowed out except when conditions are bad. If you want a lunch out this is also a good place, but you wont get the views as a ski school uses the room. But there have a cosy and rather twee alpine-hut restaurant next door wih extremely efficent waitresses. And a drink at the top of Piz Nair is a total must as well. You can usually get a table for coffee if you get there before 11am. They have a rather tempting selection of alcoholic coffees. Or the Quatrro bar at Corvillia for a cool ski-bar. Djs all day playing chill-out dancy stuff which temps one to linger and drink early cocktails. For packed lunches there is a heated picnic room in Marguns. Watch the races on the Olympia Bob: The world’s only natural ice bob run (there is no concrete underneath). They practice every day in the season but if you are there for a race it is even better. http://www.olympia-bobrun.ch You can walk down a really good footpath from the top near the Kulm Hotel all the way to celerina and get the bus or train back. Stop at the bar on the amazing horseshoe bend to watch the action. They do ‘taxi’ Bob rides if you want a real thrill. Relaxing Sledging: Top day out. Take the train to Preda, hire a slege there and head down the old road, that is shut in winter, to Berguns. It is 6km long and really picturesque as it winds over and under the World Heritage Site railway line. When you get there, lots of Gluwein stalls await and the train back up to do it again. Eyes on stalks sledging: The sledge-run down from Muottas Muragl is absolutely terrifying, You will need your helmet. I was convinced I was going to die all the way down. Before you launch down, a drink at the Ice Bar at the top would be useful. There are also lovely lovely walks out into the mountains here, where Ibex live, and there’s a restaurant/hotel too (obviously). Costs included in the ski pass, so you can do after a morning on the slopes. Ursli path: a lovely walking path themed around the fantastic children’s book ‘A Bell for Ursli’ taking you up to Salastrains. Take a sledge and kids can sledge down (it’s not officially a sledging route so be prepared to be frowned at by Swiss people). The path finishes at the Salastrains nursery slope where the hut that was used to film the original Heidi TV series now lives. Go in. Be Heidi and Geiserpeter. Read “A Bell for Ursli” before you go. The Cresta Run: The famous Cresta run and and the Olympia Bob start opposite sides of the road and finish in nearly the same place in Celerina. Skating, swimming and curling: St Moritz Bad has a lovely skating rink you can see from the flat but there are outdoor rinks all over the place. And there’s a new refurbished pool, which surely must be the most luxurious public pool in the world. It has an gigantic outdoor jacuzzi pool where you can watch the sun set on the snow through the steam rising from the water. You can also try curling on an outdoor rink Surely nothing more romantic than that. White Turf: If you are there in February it is peak ‘St Moritz’. This really is the Season to visit if you can. St Moritz does events impeccably, like nowhere else. There is everything from dance music on the slopes to horse racing, polo, night time horse racing on the frozen lake, classic car rallies, classical music, food, and of course ski races, Bob races, and the famous Engadine ski marathon. List of some of the events here. Night Skiing: Corvatch has a floodlit ski slope. I’ve always wanted to go on one of their Friday ski parties (7pm-2am). Loud music and lots of slope-side bars. One of St Moritz’s oldest buildings on the road between Via Salet and St Moritz dorf. It is now a museum about Engadine life and is a good morning spent if the skiing isn’t so good. It is under renovation until December 2016. Segantini was an artist who lived in the area in the late 19th century. The museum is the largest collection of his works. It is a short and beautiful walk up the hill from the flat. A beautiful walk and a good lesson in glacial retreat. The Morteratsch glacier used to end at the train station and it is now a 5km walk to the ice-fall at the end of the glacier. It is well signposted and markers show the position of the glacier by year as you walk. While you wait for the return train, a coffee or a meal at the hotel is highly recommended. Have one of their Engadine specialities: spatzli, pizzocheri, rösti or capuns. Take the train, direction Tirano, and alight at Morteratsch, about 20mins from Ponterisina. If you have a ski pass, the train and bus travel is included. The St Moritz ski pass is valid in the evenings for public transport and mountain railways. A trip up to Muottos Muragl for a drink in the evening gives a fantastic view of lights down the valley. Get the bus or the train to the mountain railway. Or check if the restaurant at Piz Nair is open and go for a bit of après ski at altitude. St Moritz has built a brand-new swimming pool and spa, it has flumes and rooms of peace and tranquillity and a steaming outdoor pool. St Moritz now has a system when you can buy ski tickets at a discount of up to 30% when you buy them in advance of your visit. You can do this at the Snow Deal website. Under 6 years old are free and kids won’t need it if they are beginners at ski school. Ski school can advise whether they do need a ski pass. The ski pass is valid on trains and buses within the St Moritz area and also on lifts like the one to Muottas Muragl. There are family pass discounts where first child pays the full amount, second gets a discount and the third a larger discount. If you are beginners and will be getting the train down, rather than skiing down you may want to hire and drop off at St Moritz Dorf. You drop them at 10am at Salastrains (an easy short run down from the top of Signalbahn) or, if kids are beginners or you want a day skiing another mountain or doing non-skiing stuff, you don’t pay any extra to drop them at the Chantarellabahn in St Moritz Dorf at 9am. They get taken up on the mountain railway then packed into horse drawn carts under sheepskin and taken up to the nursery slopes. Lunch is optional and well worth it – kids are given a meal in their own lunchroom and also have a playroom with all sorts of facilities to hang out in. It is barely more expensive than buying them lunch in a mountain restaurant anyway. You then pick them up at 3 at Salastrains and ski back to the flat, or at 4pm at the bottom of Chantarella. Most carriers fly into Basel and/or Zurich. Look out for a ski-rail combination ticket that can save you money if you want a 6-day pass. Children travel for free when traveling with a parent if you get a Family Card, which is just 20CHF so don’t buy them a ticket. There are lots of types of tickets including the Swiss Transfer Ticket Combi which you get at any railway station (or SBB office in Airports) This gets you the transfer to your destination and back, and half price travel on everything for a month, and a free family card so that kids are free. There is also, to utterly confuse, a super saver travel for travel after 9am that is a flat fee of CHF47 but only some routes. From the Station at St Moritz there are regular buses at all times of day. Take the number 3 or number 6 bus (the number 3 usually leaves a couple of minutes after the train from Chur arrives so go straight to the bus stop). These buses will drop you at the bottom of Via Salet (bus stop name is Via Salet). The 1 and the 9 will also take you close by if you alight at Reithalle. If you want to splash out you can even get a horse drawn carriage from the station to the door (this is St Moritz after all). 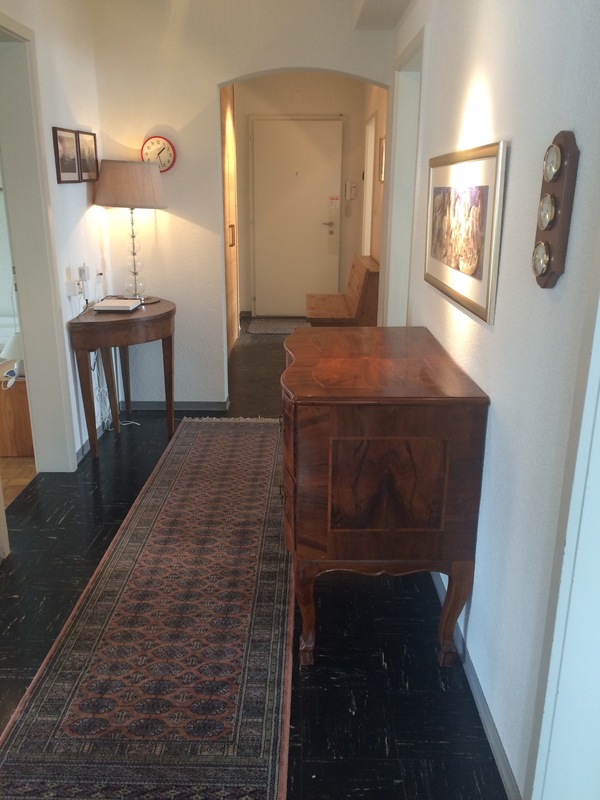 If you havent much luggage, the flat is a lovely 20 minute walk along the lake shore path. There is an option of getting your luggage transferred direct onto the plane on the way home, however you need to deposit it all at the station the night before which may not suit everyone. There is a car park very close by (just 2 minutes walk) – it is called Parcheggio per bar Colazione and it’s at Via Giovanni Segantini 1 San Gian. There is a day and a weekly rate. Weekly and monthly tickets available from the police station. However you can park for free if you don’t need to use the car for your stay at a car park a short bus ride away – called Islas/Gunels. 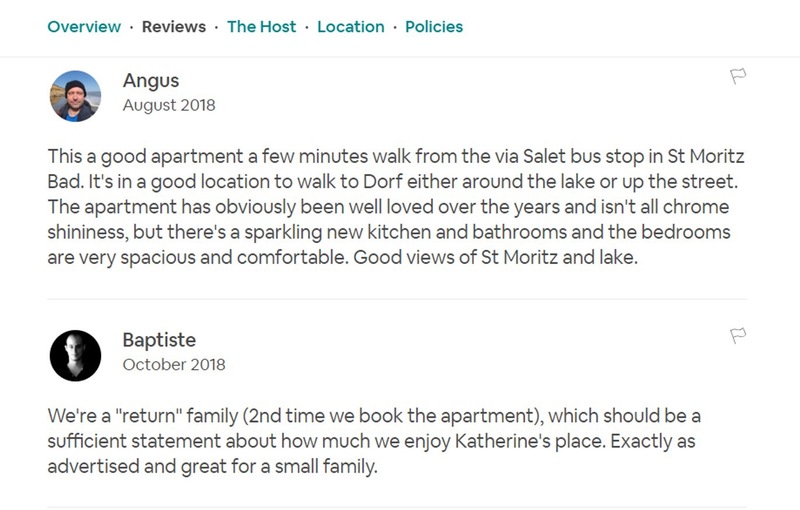 There is a document called Parkplatztarife Gemeinde St. Moritz on the Gemeinde website which has all the information and tariffs.